1954 Simplicity #4719 vintage sewing pattern, misses' low-cut sweetheart neckline blouse, size 16. 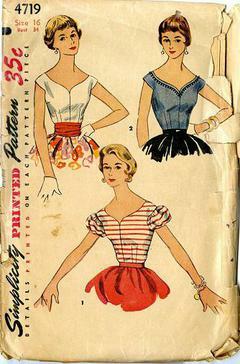 The fitted blouse has a low neckline in front and in back. V. 1 has short puffed sleeves. V. 2 is sleeveless and neckline may be trimmed with braid.